It’s a rolling tragedy, in time-lapse. Fire always offers a chance at beauty, if we don’t think about the destruction the fire wreaks. 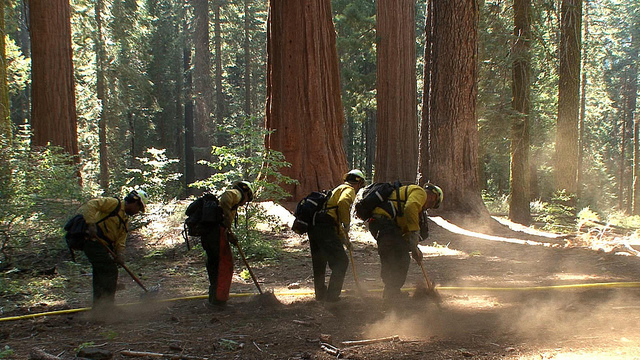 A lot of cameras around Yosemite, and some were set to do time-lapse photos of the recent Rim Fire. One hopes there is some academic value to these films, perhaps in demonstrating how the diurnal rhythms of the atmosphere changes the behavior of fire (notice how smoke often changes directions at sunset, and then at sunrise, and back again). All that smoke. Much of it was living plant material just a few weeks ago, and we watch it turned to tiny particles and gases, and spread by the winds. Time-lapse photography shows various perspectives of the 2013 Rim Fire, as viewed from Yosemite National Park. The first part of this video is from the Crane Flat Helibase. The fire [was] . . .burning in wilderness and . . . not immediately threatening visitors or employees. The second half of the video is from Glacier Point, showing Yosemite Valley, and how little the smoke from the fire has impacted the Valley. In this next piece, you’ll see footage of fire fighting operations, including a back-burn, and helicoptering of supplies to firefighters on the front lines. It’s the non-time-lapse version, with wildtrack sound. Fire crews in Yosemite conducted firing operations along the Tioga Road this week to provide a buffer of protection from the Rim Fire. As you can see in this video, the fire mostly burns debris on the forest floor rather than the trees. It’s only when the forest floor accumulates too much debris or too many young trees that a small fire like this gets hot enough to torch mature trees and spread from treetop to treetop. Later in the video, we give you a behind-the-scenes peek at Yosemite’s Helicopter 551 ferrying supplies from the Crane Flat helibase. The timelapse, from August, has over a million-and-a-half views on YouTube; the non-timelapse, a few weeks later, has fewer than 6,000 views, as I write this. Time-lapse is very popular. People living close to National Parks are lucky to do so; people who work in them luckier still, in the lifetime sweepstakes for seeing breathtaking sites. NPS employee (Ranger?) 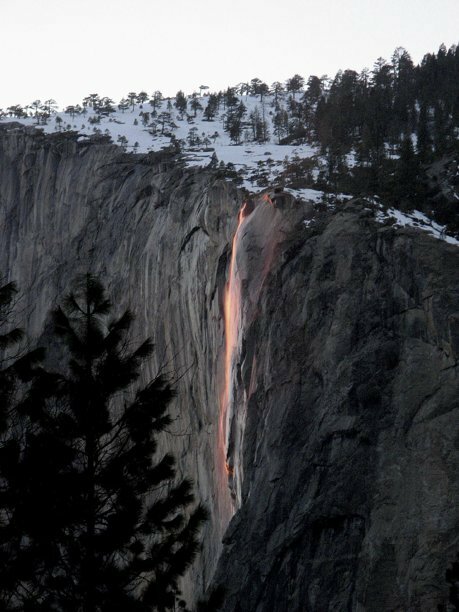 Bethany Gediman caught this image of Horsetail Fall in Yosemite National Park. Be sure to see the video of Yosemite Nature Notes No. 14, posted here earlier. It shows Horsetail at sunset in full glory. Great photography. 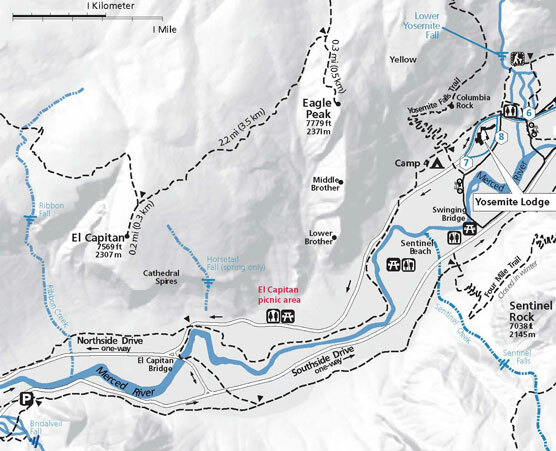 Map of Yosemite National Park, showing Horsetail Falls and hiking trail to get to viewpoint in the photograph. Anybody got photos of Texas’s Big Lake with, you know, water in it? Contrary to popular rural and redneck legend, Caddo Lake is not Texas’s only natural* lake. There’s also Big Lake, near the town of Big Lake. Problem being, of course, that Big Lake’s water sources these days generally don’t flow. So Big Lake is often dry. Which produces a further problem for site like Millard Fillmore’s Bathtub: If Big Lake is really a lake, why are there no photos of the lake with water in it? A comment at AustinBassFishing.com got me thinking about this again, no photos of Big Lake as a Lake. In the previous post here, we featured a photo of Big Lake Playa, sans water. I searched the internet at the time and found no photos showing water in the lake. My authority on Big Lake, Brad Wachsmann, swore that he had recently seen water in the thing (“recent” being “in the last decade or so”). Water in Big Lake, near the city of Big Lake, Texas, laps at the State Highway 137 passing nearby. This photo comes from 2004, by doning. Photo of water in Big Lake from June 2005. Photo by evansjohnc. This photo appears to be about midway along the intersection of the lake with State Highway 137. Big Lake in its dry phase, from looking north from the southern end of State Highway 137’s transection of the lake. Photo by cwoods. Non-historic marker for Big Lake, also along State Highway 137, looking west. Photo by cwoods. Photo taken during Big Lake’s dry humor phase. Now: Can we track down the rumors of other natural lakes in Texas? Sabine Lake? Green Lake? Natural Dam Lake? And, Dear Reader, can you find good photos of Big Lake with, you know, water in it? * Is Caddo Lake a natural lake? Originally, the lake seems to have been formed by an enormous blowdown of trees, probably during a hurricane, well over 400 years ago. In that sense, it was a natural lake when European explorers first found it, and during all of Texas’s “six flags” historic periods. Or, what is known as the Great Raft, a log jam, dammed up the Red River near the confluence of the Big Cypress Bayou, in about 1799. By 1800, Caddo Lake was wet all year-round, and deep enough for shallow boat navigation. In 1835, Capt. Henry Shreve blew up enough of the logjam that steamboat traffic could get past (the guy after whom Shreveport, Louisiana, is named). After the Civil War, locals tried to expand boat traffic by completely removing the logjam. Instead of making traffic easier, this removal led shrinking water levels in the lake, and it destroyed navigation farther up the Red River. Several efforts to restore higher water levels achieved some success by about 1915. When oil was discovered under the swamp, pressures came from oil companies to make drilling easier — travel in the mud was difficult. After the invention of the Hughes drill bit (by Howard Hughes‘s father, the founder of Hughes Tool Co.) to allow drilling through water and mud into oil-bearing rock, a dam was built near where the logjam had been, to raise the level of what is known today as Caddo Lake. What is seen today is a human-enhanced version of the Caddo Lake known by the Caddo Tribe. This is all preface to the current Texas water wars. The oil rig used for Santa Rita #1, the rig that caused the pollution that killed Big Lake, is on the campus of the University of Texas. What is it? If you were a lady walrus a few million years ago, you wouldn't have to ask! I can’t do it justice. Go read about the photo at Retrieverman’s site. My students hear it often: Truth is stranger and often much more interesting than fiction. It certainly applies in history, and it applies in science, too.